Fountaine Pajot is world renowned for building sleek and purposeful catamarans. 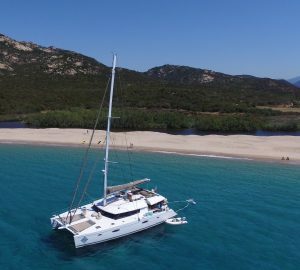 This owners' version of the Venezia 42 continues the tradition; stunning lines and exhilarating performance, coupled with comfortable accommodation for six guests in three double cabins with two heads and showers, ensure a memorable sailing vacation. Her large transoms make diving and snorkeling a pleasure, and with nearly 1000 square feet of deck, she has plenty of room for sunbathing or reading in the shade of the bimini. The boat has been set up for short-handed sailing, with control lines leading back to the cockpit. 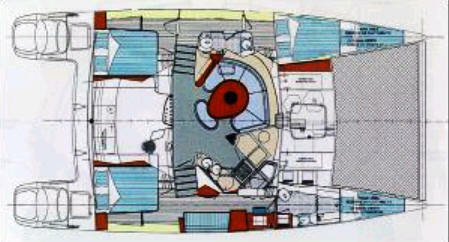 Performance is excellent on all points of sail due to an efficient underbody and sail plan. The Venezia 42 is designed with space and comfort in mind with comfortable accommodation for six guests in three double cabins with two heads and showers. Fuel capacity is 90 gallons, Water capacity is 135 gallons. 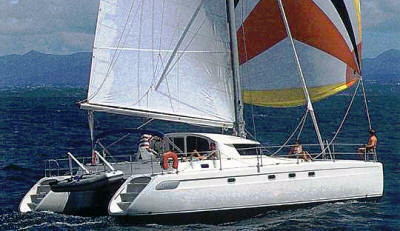 This yacht has a stack pack main sail and rolling furling genoa. 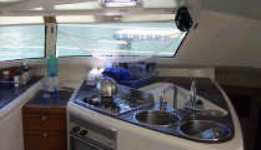 There is a GPS, autopilot, electric windlass, log and depth sounder, bimini and on deck BBQ. 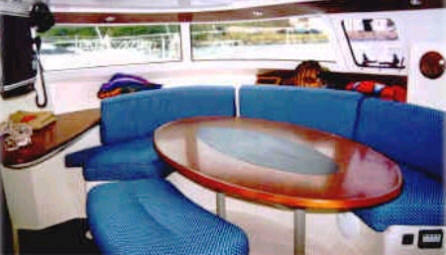 The galley is fully equipped with a 12 volt fridge/freezer, oven and stovetop with full utensils. Entertainment includes a CD/tape player. You will also find a COMPLIMENTARY STARTER KIT WITH Westerhall Rum, Coca Cola, Bottle of Spring Water, Washing up Liquid, Roll Paper Towel, Kleenex tissue, Handiwipes & sponge, 4 Trash Bags, Spice basket (salt, pepper, hot sauce, herbs), One roll toilet tissue per head/shower, Palmolive soap, Matches, OFF Insect Repellent and Toilet Bowl cleaner.